Ideal for loading or unloading pallets or skids. 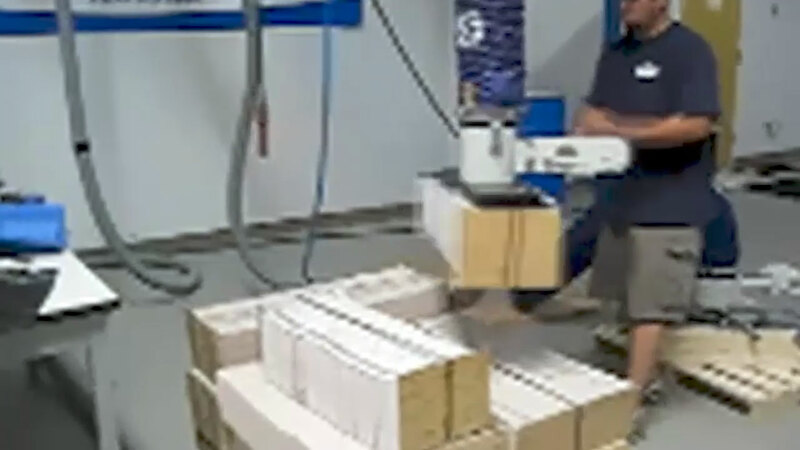 Problem: The customer was de-palletizing signature bundles weighing up to 100 pound boxes by hand. The operators were taking the boxes from a pallet to an in-feed conveyor roughly 3 feet away. The customer installed a long XY bridge crane system with multiple vacuum lift assist to handle the continuous lifting of the bundles. The parts were typically 2 foot long by 1 foot wide, making them bulky for the operators to handle by themselves. This was a constant area for operator fatigue and strains. The operators were lifting the bundles anywhere from 2-3 times per minute making it a tough job when high density material was running. Requirement: Pick up multiple boxes per minute to handle the in-feed for a printing application. Solution: A custom vacuum head was developed and was powered by a Schmalz vacuum generator. The vacuum lifting equipment we prepared was smooth, quick, and precise, allowing the operators to lift the bundles easily. The XY Gorbel crane the lifters were attached to took less than 5 pounds of force to move in any direction. 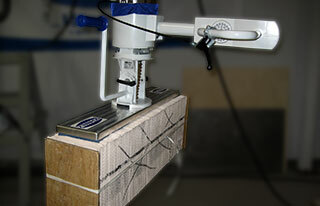 Result: Operators consistently had to rotate on and off this job due to the potential for ergonomic stress and strain. Operators now can work on the job all day with no fear of strain or injury. The bundle lifter device converted a bad job in the plant to a coveted job. Ergonomic Partners is a distributor for signature bundle lift assists; serving clients from coast to coast, Canada, Mexico and especially focused in the states of Missouri, Illinois, Indiana, Kansas, Arkansas, Mississippi, Nebraska, Tennessee, Kentucky, Iowa, and Oklahoma. Contact us today.